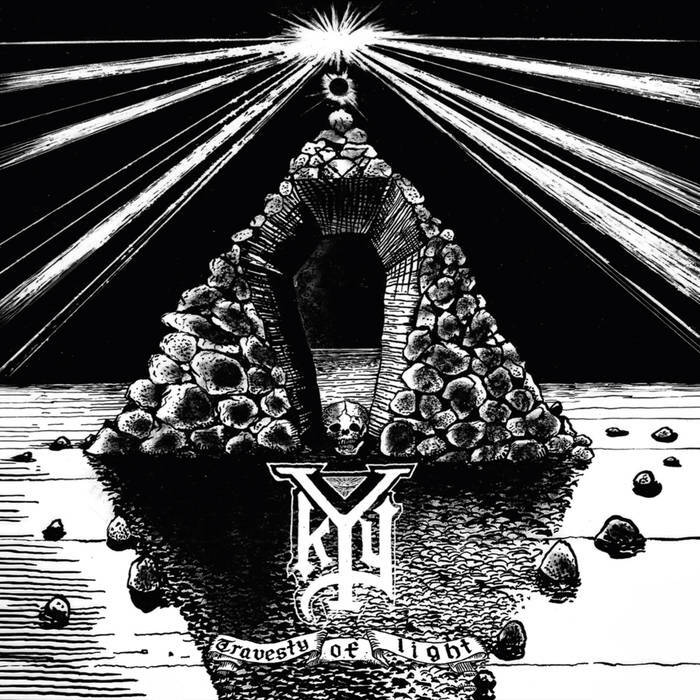 Kyy are a band from Finland that plays a very raw, old school and satanic form of black metal and this is a review of their 2015 ep "Travesty Of Light" which will be released in August by Saturnal Records. Drum beats along with some heavy, and melodic guitar riffs start off the ep along with an atmospheric background and grim black metal screams and the vocals also get very deep at times along with a few angry shouts and spoken word parts and when guitar leads are utilized they are in a melodic musical direction. When the music speeds up it goes for more of an early 90's Nordic black metal style along with a great amount of blast beats and the music at times also adds in a touch of rock'n'roll and punk and the songs also bring in a great mixture of slow, mid paced and fast parts as well as remaining true to a second wave style of the genre and they also bring in a brief use of melodic chants as well as a brief use of clean playing. Kyy plays a style of black metal that is very raw and old school sounding in the second wave Nordic and Finnish traditions and also avoids sounding modern, the production sounds very dark, raw and heavy while the lyrics cover Satanism and Left Hand Path themes. In my opinion Kyy are a very great sounding raw, old school and satanic black metal band and if you are a fan of this musical genre, you should check out this ep. RECOMMENDED TRACKS INCLUDE "Death - The great Liberator" and "Travesty Of Light". 8 out of 10.